But get behind Queen’s arty hotels and shops (as Mr. Remsen apparently never did) and you find the more durable pleasures the area has to offer. These include long, spottily preserved residential streetscapes developed late in the 19th century and populated by sturdy gothic single-family and row-houses put up for working-class Victorians. Utility and respectability, not charm or flair, were the builders’ architectural priorities. Yet this modest housing, much like formerly run-down Queen Street, has acquired a certain funky patina that partly accounts for its new-found status as a destination for cool-seekers. Well-heeled local hipsters, outwardly bound veterans of downtown’s residential towers, want to live there. And the out-of town hip, or would-be hip, want to stay there when in town to inspect the scene. To welcome the latter clientele, developer Laleh Rouhani (Luloo Boutique Homes) bought a semi-detached, single-family dwelling at 166 Dovercourt Rd., steps away from the most densely chic stretch of Queen, and gave Toronto’s Ja Architecture Studio the job of divvying up the building into Airbnb units. 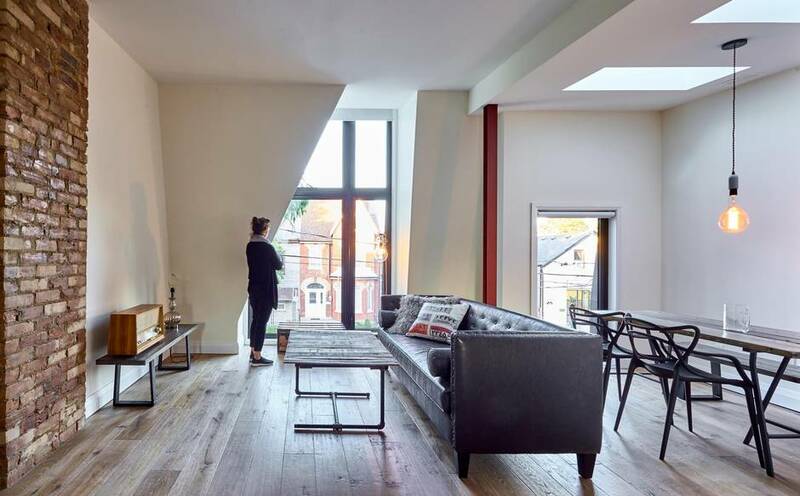 Now completed according to a design by Ja architect Nima Javidi and designers Behnaz Assadi and Hanieh Rezaie, the project contains three attractively efficient, sparsely outfitted two-bedroom suites – one on each of the two above-ground floors, the third in the basement. Each apartment is around 1,000 square feet in area, and rents, Ms. Rouhani said, for between $400 and $500 a night. Parking for three cars is provided at the rear. While some of the bedrooms are tight, the layout of the house is mostly open and airy. Though the second bedrooms are just large enough to hold two-person beds, without an inch to spare, the internal layout of the space, in all other respects, is open, airy and comfortable. But the plan is not what’s memorable about this scheme. Rather, it’s the two-storey streetside façade Mr. Javidi and Ms. Assadi have attached to the exterior of the old house they’ve renovated. The basic materials of this composition are transparent glass and darkly glowing, weathered copper. The designers have combined these handsome elements – light and clear, thickly opaque – to create a strong, steadily focused visual episode in the otherwise unexceptional streetscape. Above the front door is a deep glazed recess framed by metal sheets that bend inward, toward the body of the house, as they rise. Answering this fluid, receding sculptural gesture, a copper-edged glass box, two storeys tall, pushes out from the house’s volume. My description of the façade, with its interplay of two contrasting formal strategies – retiring and forward, largely opaque and largely transparent – may make it sound too busy for a small residential work. It’s not, and the front sings in an abstract, urbane key that is surely the right music for its culturally savvy neighbours and renters. Architect Nima Javidi and designers Behnaz Assadi and Hanieh Rezaie used transparent glass and weathered copper to create a front that is strong, but not loud. The front is bold, but not visually noisy. The subdued, sombre tone of the copper cladding is a close match, as far as colour goes, for the elderly, reddish-brown brick fabric round about. The geometry is not timid about its poetic, radical pedigree – it is a leaf on Le Corbusier’s tree – but neither does it brag about its lineage in the company of the blue-collar Victorians up and down the street. Getting the façade’s public music right, I gathered from Mr. Javidi and Ms. Assadi, was the chief challenge of the commission. Residents, and city planners, are trying to maintain the sense of the zone’s historical character, or what’s left of it: Before people started to care, the area saw some awful architectural interventions, ranging in style from Mediterranean fiesta to sarsaparilla modernism. Ja’s Dovercourt house, on the other hand, is lovely, and should be quite smart enough for the sophisticated souls who will be using it as a base-camp for exploring Toronto’s version of cool.